Sergio was quite excited to share with you the island where he grew up, Isla Escudo de Veraguas, which is off the coast of Panama. The pygmy three-toed sloth is critically endangered and is ONLY found on the Isla Escudo de Veraguas. Because of the limited resources of space and food, the sloths on the island are 40% smaller than their mainland cousins. 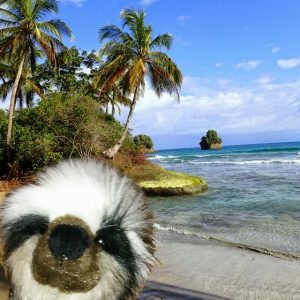 While he loves his beautiful island, he is happy to have left Panama to live with Luna because together they will have many adventures. When I mentioned he was barely in his picture, he grumbled. I asked what was wrong. His response: Do you know how hard it is to take a picture when you have long nails and only three fingers?